1867. St. Pancras Railway Station, designed by Barlow. 1869. Coal dock of the Midland Railway at St. Pancras. William Henry Barlow (1812–1902) CE, FRS, was an English civil engineer of the 19th century, particularly associated with railway engineering projects. 1812. Born in Charlton in south-east London, the son of an engineer and mathematician Professor Peter Barlow, who taught at the Royal Military Academy in Woolwich). William Barlow grew up close to Woolwich Dockyard and his formative years as an engineer were spent studying with his father and working in the Dockyard’s machinery department. He then spent six years working as an engineer in Constantinople, Turkey, helping build an ordnance factory on behalf of Henry Maudslay’s Maudslay, Sons and Field machine tool company (and working on some lighthouses in the Bosphorus). 1851 Resident Engineer of the Midland Railway. 1857 He formed his own consulting practice and remained a consultant for the Midland Railway. An active member of the Institution of Civil Engineers, Barlow became involved in several ICE initiatives, including the design of the building used for the 1851 Great Exhibition and the realisation of the Clifton Suspension Bridge in 1864 after the death of the celebrated Isambard Kingdom Brunel in 1859. As chief engineer for the Midland Railway, Barlow was responsible for sections of the main railway lines between London and the east Midlands. 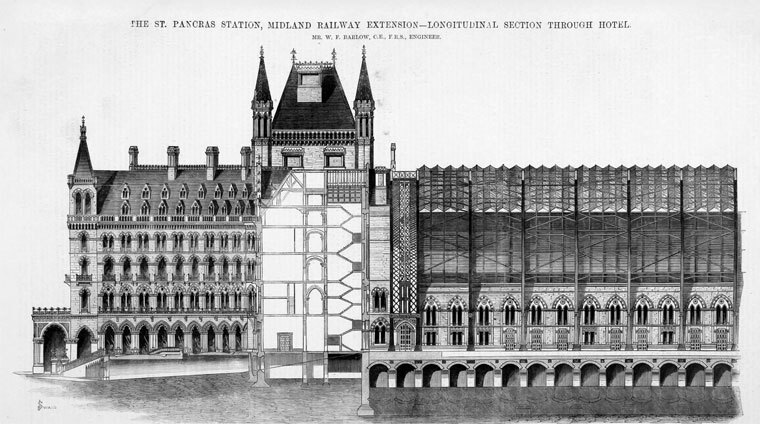 The route’s most famous landmark is the train shed at its London terminus: St Pancras Station (1864-68), which Barlow designed with Rowland Mason Ordish and William Henry Le Feuvre. This has an arched cast iron and steel canopy with a 243 ft span – then the longest of its kind in the world. The canopy is 700 ft long and about 100 ft high. George Gilbert Scott designed the hotel in front of the shed. His brother Peter William Barlow was also a noted engineer, whose major contributions included new developments in tunnelling shields in conjunction with James Henry Greathead – a pupil of William Barlow’s during the late 1860s. Barlow was a Fellow of the Royal Society from 1850, and was elected as president of the Institution of Civil Engineers in 1879. His leading role in the profession led to his appointment as a commissioner of the Board of Trade Inquiry that investigated the disastrous failure of the railway bridge across the River Tay near Dundee in 1879 (the Tay Rail Bridge Disaster). The centre of the bridge collapsed in a storm on the night of 28 December 1879, and an express train from Edinburgh was on this part of the bridge when it fell. There were at least 75 victims, including all the passengers and crew, 29 of whose bodies were never recovered. He sat with Henry Cadogan Rothery and William Yolland, co-authoring one of the final reports with Yolland. They concluded that the original Tay bridge had been "badly designed, badly built and badly maintained". The old bridge had used cast iron columns reinforced by wrought iron tie bars, but the connections were cast iron lugs. They were placed under tension and deteriorated during the short life of the structure, loosening and cracking, until they failed catastrophically on the night of the disaster. The entire centre section of the bridge collapsed, leaving a gap of nearly half-a-mile in the 2 mile long bridge. The thirteen towers supporting the massive girders which held the railway track had failed in sequence owing to several design flaws in their structure. The report caused a sensation at the time, and the engineering profession came under severe attack in the press. William Barlow led the design of the replacement bridge (1882-87) with his son Crawford Barlow. They used massive monocoque piers to support a double railway track, and made from wrought iron and steel. The old brick and masonry piers from the first bridge built by Thomas Bouch were retained as breakwaters for the new piers upstream. They can still be seen today as a forlorn reminder of the tragedy of 1879. During the same period, he also helped check the designs for the Forth Bridge, west of Edinburgh. 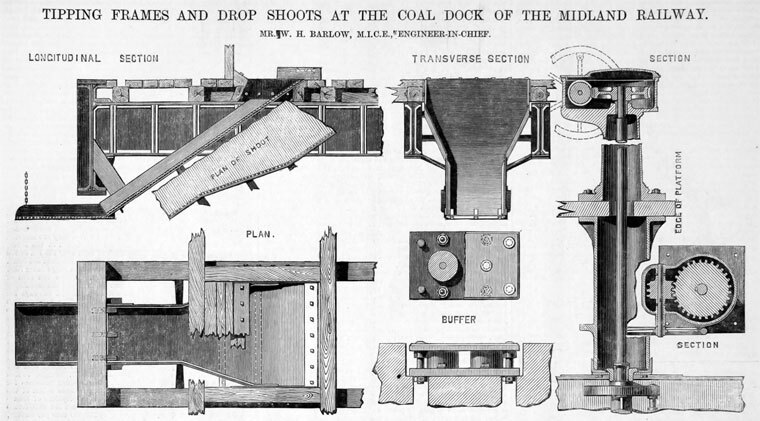 Barlow invented and patented the Barlow rail, a type of railway rail in 1849. This rail was very broad, with an inverted V shape and was intended to be laid straight onto ballast, without the need for sleepers. However it had a tendency to lose its gauge and was soon replaced. WILLIAM HENRY BARLOW, F.R.S., who died at his residence, High Combe, Old Charlton, on the 12th November, 1902, in the 91st year of his age, was the younger son of the late Mr. Peter Barlow, F.R.S., Professor of Mathematics at the Royal Military Academy, Woolwich, and was born in 1812. On leaving school at the age of 16, he spent a year in studying engineering under his father's scientific tuition; and then for three years was an engineering pupil, first in the machinery department of Woolwich Dockyard, and afterwards under H. R. Palmer, the Engineer and Chief of the London Docks, where he was employed on the then new eastern entrance. In 1838 on his return to England he was appointed Assistant Engineer to G. W. Buck, then engaged on the construction of the Manchester and Birmingham Railway. On the completion of the line to Crewe in 1842 he was appointed Resident Engineer to the Midland Counties Railway; and subsequently in 1844 to the Amalgamated Railways, called the Midland Railway, Mr. G. R. Stephenson being the Consulting Engineer. It was while looking after the permanent way on this line at that time that Mr. Barlow designed a saddleback rail, known as the 'Barlow' rail, which was at one time largely used, notably on the Great Western Railway, where it may still be seen in some of the sidings in the country station-yards. The Midland Railway rapidly extended its system by constructing new branches and leasing contiguous lines, of which Mr. Barlow became the principal Engineer-in-Charge, and held that appointment until 1857, when he came to London and was made the Consulting Engineer. 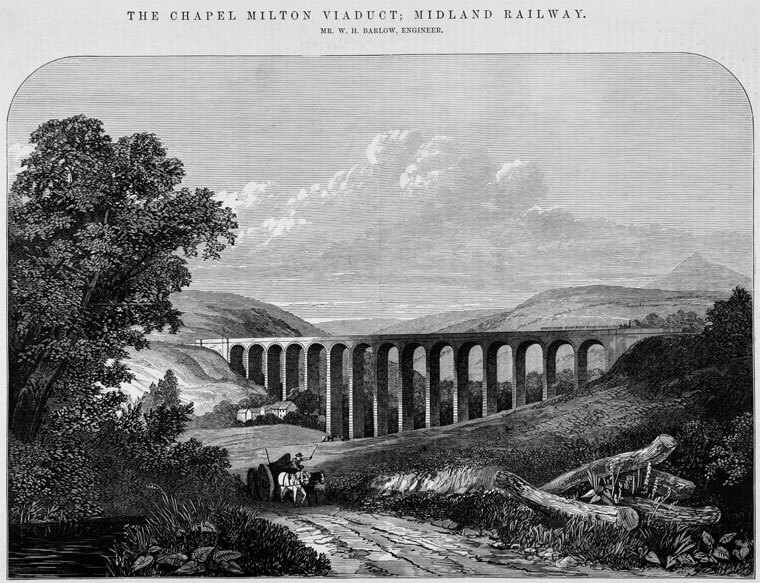 Amongst the numerous railways he constructed for the Midland Company, mention should be made of the line from Rowsley to Buxton and its extension to New Mills, forming the Midland route to Manchester, where the works were of exceptionally heavy character, owing to the difficult country to be traversed. The works of the Dove-Holes Tunnel on the latter line were carried out directly by Mr. Barlow and a staff, as no contractor would undertake the responsibilities except on prohibitive terms, owing to the presence of considerable amounts of underground water, a fact which testifies to the confidence the Company placed in him. From 1862 to 1869 Mr. Barlow laid out and constructed the southern portion of the London and Bedford, a line which, by giving the Midland independent access to London, placed it on the footing of one of the great railway systems of this country. One of the principal works on this line is the St. Pancras Station, the arrangements of which, including the great roof of 240 feet span, were designed by him. The St. Pancras roof was at the time of its construction the largest erected, and tho design was novel, and constituted a type of roof which has since been copied extensive1y. His next work for the Midland was a joint scheme with the Manchester, Sheffield and Lincolnshire Railway for a line from Rushton to Doncaster, but this was so mutilated in the Parliamentary Committee that it was abandoned, and the following year (1874) powers were obtained for a line from Kettering to Manton, and another to Nottingham, and the construction of the Kettering and Manton line, which had some very heavy works, occupied from 1875 to 1860. The object of these lines was the bringing the coal more economically to London, and to further effect this he was instructed to lay out widenings and deviations to the Midland main line between Bedford and Rushton with better gradients, and the part between Wellingborough and Rushton he constructed, while the rest has been carried out by the Company from his plans. His last work of construction for this Company was the building of a second tunnel under Hampstead and the doubling of that part of the line. Besides these works he was constantly in requisition in Parliamentary Committees, arbitrations, etc., when the interests of the Company required it, and, lastly, was engineering representative of the Midland in the conference in respect of the Forth Bridge. In addition to his work for the Midland Railway, Mr. Barlow will be best known by his connection with the large bridges built in the latter half of the century. His theoretical knowledge enabled him to evolve new principles of design and to introduce the use of steel, and so generally to advance the science of bridge building ; consequently his advice was constantly sought. In 1860 Mr. Barlow, in conjunction with Sir John Hawkshaw, designed the completion of the Clifton Suspension Bridge near Bristol. A Paper describing this was read at the Institution in February, 1867, but it may here be recapitulated that a bridge had been designed in 1836 by the late Mr. I. K. Brunel, and part of the works, viz., the abutments and piers, erected, but owing to insufficiency of funds the works ceased in 1843. In 1860 Mr. Hawkshaw (afterwards Sir John Hawkshaw, Past-President) was constructing the Charing Cross Railway, and as this involved the removal of the then existing Hungerford Suspension Bridge, the chains were available. These were originally made for the Clifton Bridge, but were taken to Hungerford on the stoppage of the Clifton works. The Clifton Bridge - the largest Suspension Bridge in this country - has a span of 702 feet, and the platform is 248 feet above the River Avon. After the great catastrophe to the old Tay Bridge in December, 1879, a disaster which caused consternation amongst engineers not only in this country but also throughout the world, the Board of Trade appointed a special Court of Enquiry, consisting of Mr. W. H. Barlow, Colonel Yolland and Mr. Rothery. This Court made searching investigations with reference to the design, workmanship and materials. The finding of this Court was to the effect that the failure was due to the cast-iron columns and the method of cross-bracing employed, and they concluded their report by drawing the attention of the Board of Trade to the fact that there was no requirement respecting wind-pressure, and that there did not appear to be any understood rule in the engineering profession regarding wind-pressure in railway structures, and recommended that the Board should take such steps as might be necessary. This was followed by the appointment by the Board of Trade of a committee consisting of Sir William Armstrong Mr. W. H. Barlow, Sir John Hawkshaw, Professor Stokes, and Colonel Yolland, R.E., who, after obtaining evidence as to wind-pressure from all parts of the world, reported as to the rules which they thought necessary, and these were inserted in the Board of Trade Requirements for Railway Structures. The North British Directors then referred the question of reconstruction of the Tay Bridge to Mr. Barlow, who, after a very rigorous examination of the old bridge and testing some of the piers, advised that an independent bridge should be constructed parallel to and 60 feet from the old bridge, and that in it only the girders of the standing portions of the old work should be utilized. Accordingly an Act was obtained in 1881, and after a difficulty with the Board of Trade concerning the removal of the old bridge had been disposed of, the works were commenced in 1882, and the new bridge was completed and opened for traffic in June, 1887, the contractor being Mr. (now Sir William) Arrol. This bridge, about 10,520 feet in length with 85 spans of different dimensions varying from 245 feet to 50 feet, is described in a Paper read before the Institution in May, 1888. No. l. Suspension bridge with stiffening girder. Nos. 2 and 3. Suspension bridges with braced chains, by Mr. Barlow. No. 4. continuous girder bridges by Mr. (now Sir B.) Baker, who remarked that this type had been the subject of a patent by Mr. Barlow in 1859. Calculations of the weights, stresses and cost of these different types were made, and showed that in every respect the continuous girder design was the best solution of the great problem. Having reported this to the four companies, Messrs. Harrison, Fowler and Barlow were asked to submit a design of a bridge, and take the necessary steps to obtain the approval of the Board of Trade and Admiralty. Amongst other bridges, Mr. Barlow was consulted in 1880 about the Dufferin Bridge over the River Ganges at Benares. This was constructed by the Oudh and Rohilkhand Railway Company, and by it a duplicate and more direct link is formed between Bengal and the Punjab, The design was arranged between Mr. Hederstedt, the Company's Chief Engineer in India (who supplied all the local information), Mr. Batho, the Consulting Engineer in England, and Mr. W. H. Barlow. The bridge consists of seven large spans, 356 feet each from centre to centre of piers, and nine smaller ones of 114 feet spans ; the girders are of steel, 25 feet apart. The allowance for wind-pressure is 60 lbs. per square foot. On account of the great scouring action of the river, the foundations, which consist of large elliptically shaped caissons, had to be sunk into the bed of the river 120 feet. In 1886 the New South Wales Government were constructing a railway to connect Sydney with the railways in the north part of the colony, terminating at Newcastle, and so making a connection with Queensland, and this involved a bridge over the estuary of the Hawksbury River. The Colonial Government decided to invite not only tenders for the construction of the work, but also designs for the same, and took the necessary steps to make the competition world-wide, the effect of which was that numbers of very interesting designs were sent in. A committee, consisting of Mr. W. H. Barlow, Mr. (afterwards Sir George) Berkley and Captain Douglas Galton, R.E., were appointed to adjudicate, who, after receiving a supplementary report from Sir J. Fowler, Consulting Engineer, and Mr. Whitton, Engineer-in-Chief for Railways, New South Wales, accepted the design and tender of the Union Bridge Company of New York. This design consisted of seven spans of 416 feet each, from centre to centre of the piers. The girders were of steel, and formed of compression members and solid eye-bar tension rods, all the connections being made by steel pins. The girders were 58 feet deep at the centres, the pairs being 28 feet apart, and arranged for two lines of railways. The piers were of masonry founded on large oval caissons, some of which had to be carried to a great depth. Besides his railway and bridge work, Mr. Barlow was consulted with regard to many and varied cases. When Sir Joseph Paxton was preparing his celebrated design for the Great Exhibition of 1851, he obtained Mr. Barlow’s assistance in calculating the strength of the columns and girders. In 1875, the Dean and Chapter of Lincoln Cathedral became alarmed about the West Front, which was being forced out of the perpendicular by the weight of the West Towers, and their architect having recommended the pulling down and re-erecting of the West Front, they came to Mr. Barlow. After examination of the edifice and the history and records of its building, extending over long periods, he advised them to make the structure secure with steel ties and some additional masonry, and so avoided the drastic step which had been suggested. Again in 1879, there were alarming symptoms of subsidence in Ely Cathedral, and the Dean sought Mr. Barlow, who, after making a thorough examination of the edifice, recommended a course of underpinning, which was adopted and proved successful. As a witness, Mr. Barlow was in great requisition in Parliamentary Committees, Arbitrations, and in the Law Courts, on account of his quiet and yet effective way, coupled with the faculty of presenting the most telling facts. Besides the Parliamentary work connected with the railways which he constructed, there were many schemes, the Parliamentary work of which he successfully carried through, but which were not proceeded with for various reasons. Amongst these was the Birkenhead, Chester and North Wales Railway, a scheme fought in the Session of 1873. It was thirty days in the Committee of each House, being heavily opposed by the London and North Western, and the Great Western Railway;s however the Act was obtained, but for various reasons, it was not carried out. The Regent’s Canal, City and Docks Railway, was another case in which, after an excessively heavy and costly fight in Committees, the Act was obtained, but for financial reasons was abandoned. The chief characteristic of Mr. Barlow’s life was his power of observation and investigation, which he no doubt inherited from his father. In his Presidential address’ to the Institution in 1880, he specially urged the necessity of study and experimental research, citing as an instance his father's investigations with regard to the deflections of beams, which, accompanied,by a series of clear and conclusive experiments, settled a much-disputed point. This system of research, practical and theoretical, he applied to all problems, professional and otherwise, which came before him. His investigations with regard to beams, however, are those which contributed mostly to his successful treatment of the problems involved in the great structures with which his name is associated. Following the experiments made by his father already referred to, Mr. Barlow in 1855 conducted a large series of experiments upon beams for determining practically the position of the neutral axis. These are described in a Paper to the Royal Society entitled 'On the Existence of an Element of Strength in Beams subjected to Transverse Strain arising from the lateral action of the Fibres or Particles on each other and named by the Author 'Resistance of Flexure. He ascertained that the neutral axis remained constant at the centre of gravity of the section despite variations in the amount of stress applied. These experiments established, in addition, the existence of a third element of strength in beams, which he explained thus :-The lateral action of the fibres or particles of a beam tend to modify the effect of the unequal stresses and opposite forces, and thus diminish the amount of extension and compression, and contribute, in fact, a resistance to flexure acting in addition to the resistance of tension and compression. In 1859 Mr. Barlow made another set of experiments on continuous beams, which showed that when a continuous beam, made of equal depth and section throughout, is loaded uniformly all over, the breaking-points are over the intermediate supports. He then ascertained that by increasing the depth of these beams over the points of support, the points of contrary flexure were moved nearer to the centre of the span, with the result that the sectional area of metal in the flanges of the beams throughout the centre portion of them, between the points of contrary flexure, could be considerably reduced without diminishing the strength of the beams, as compared with one of equal depth throughout. In the same year he took out a patent entitled, 'Improvements in Beams and Girders' for the construction of beams or girders on this principle. 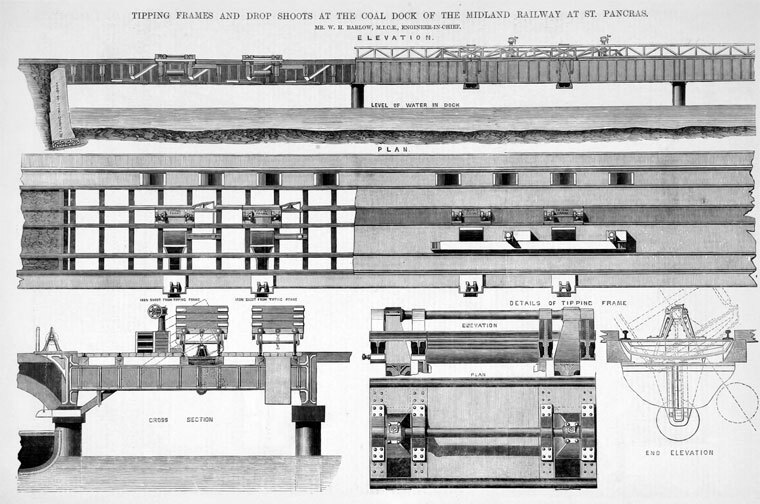 The patent described that the increase in the depth of the beams over the piers was either made above or below as best suited the particular circumstances of the case, and that when the continuous girder was of considerable length, joints were to be made at the points of contrary flexure to admit of the expansion and contraction of the girder. In fact, the girder was not continuous throughout, only over the pier, the centre portion between the points of contrary flexure being an independent girder suspended by links to the girders on either side. The principle of this system of girders here described is practically the same as that in the Forth Bridge, where the cantilevers are the continuous girders over the piers, and the centre portion of each span is an independent girder suspended to the end of the cantilevers. Besides investigations into the principles of design, Mr. Barlow took a very active part in the introduction of steel in engineering structures. In 1858-4~0 years after Mr. (subsequently Sir Henry) Bessemer had exhibited his wonderful process of manufacturing steel - he made a set of experiments at the Woolwich Arsenal, and from that time he was constantly urging the importance of the use of steel. In 1868 a Committee was formed, of which he was a member, for making an extended series of experiments ; these showed conclusively its applicability to structural purposes. Following this the British Association appointed a committee to confer with the Board of Trade, by whom, after much correspondence, the question was referred to Sir John Hawkshaw, Colonel Yolland, R.E., and Mr. W. H. Barlow. This resulted in the adoption of a coefficient for steel of 6.5 tons to the inch, it being understood that for steel of high qualities the coefficient would be raised by agreement, due precautions being observed in the testing. Mr. Barlow’s love of investigation led him to take up other scientific subjects not immediately connected with his professional work. For instance, when Resident Engineer to the Midland Railway at Derby, he had, beside his other duties, to superintend the erection of the electric telegraph. In 1847, he observed certain spontaneous deflections of the needles of the instruments, and noticing that these deflections in the lines proceeding from Derby in different directions, were almost invariably simultaneous, though different in character, he had extensive observations made, and discovered that the variations of the needles were diurnal and analogous to, and in connection with those of the magnetic needle; also that there were more violent spasmodic movements corresponding to and simultaneous with the magnetic storms which were specially marked during the prevalance of aurora. He arrived at the conclusion that the effects produced were due to electric currents on the earth's surface, and that the diurnal variation of the magnetic needle was the effect of these currents. He communicated a Paper on this subject to the Royal Society, but they were unwilling to give their sanction to his view of the case, and only consented to the publication of the observations on his omitting that portion of the Paper which contained his theories. Since then they have not only accepted his view, but have established instruments at Greenwich and other Observatories for recording the movements of the magnetic needle, and those that are due to earth-currents. The instrument consisted of a small speaking trumpet about 4 inches long, having an ordinary mouthpiece connected to a tube half an inch in diameter, the other end of which was widened out so as to form an aperture of 2.25 inches diameter. This aperture was covered with a membrane of goldbeaters’-skin or thin gutta-percha. A spring which carried the marker was made to press against the membrane, and a light arm of aluminium was connected with the spring, and held the marker or pen. A continuous strip of paper was made to pass under the marker by clockwork. A number of very interesting facts were disclosed by these diagrams, but the chief interest in this invention is that of being the forerunner of the telephone and phonograph. Mr. Barlow’s professional practice in London dates from his appointment in 187i as Consulting Engineer to the Midland Railway, when he came from Derby to London, and took offices at 19 Great George Street. In 1866 he removed to 3 Old Palace Yard. In 1868 he was appointed a Director of the Indo-European Telegraph Company, and in 1873 was President of the Mechanical Section of the British Association at Bradford. In 1874 he took into partnership his second son, Mr. Crawford Barlow, and his. assistant, Mr. C. Bernard Baker, who died in 1861. In 1876 he went to Philadelphia as one of the judges at the Centennial Exhibition. He was a Member of the Institution of Mechanical Engineers, and of the Society of Arts, and a Lieutenant-Colonel of the Engineer and Railway Volunteer Staff Corps, and in 1881 was elected a member 'honoris causa' of the Athentaeum Club, and in 1889 an Honorary Member of the Societe des Ingenieurs Civil, Paris. In 1881, together with Sir Frederick Bramwell, he was appointed the first civil member of the Ordnance Committee at that time reorganized, and continued in that capacity until his health compelled him to withdraw from active professional work. Mr. Barlow was a member of the British Association, and besides the Presidential Address which he gave to the Mechanical Section on Steel in 1873, he frequently attended their meetings and contributed Papers, among which may be mentioned, 'On the upward jets of Niagara,' 1877, and 'On the Mechanical properties of Aluminium,' 1882. Mr. Barlow was elected a Fellow of the Royal Society in 1850, and a Vice-President in 1880 ; reference has already been made to the Papers which he contributed to the Society. He was elected a Member of Council in 1863, and served the office of President in 1879-80. 'We, the Council of the Institution of Civil Engineers, desire to offer you our sincere congratulations, and to express the pleasure it affords us to know that your Interest in the Progress of the Science and practice of Engineering continues active and unabated. It must be most gratifying to you as it is to the Council, that there is now in general use the application to Engineering structures of those principles of correct Mathematical design which you inherited from your distinguished Father, and of which you were one of the earliest exponents in this Country. It is largely owing to your exposition of the theory of the strength of materials, and to your application of it, in the great works with which your name is associated that the present generation of British Engineers has been encouraged to avail itself more fully of the results of experimental research in relation to construction. This page was last edited on 12 October 2018, at 13:54.